OSWEGO – The Beacon Hotel will once again support the Autism Community as a top sponsor of the 4th annual “Out Run Autism” 5K. Pictured from left are race director and task force member Julie Chetney, and Falecia and Atom Avery, owners of the Beacon Hotel. 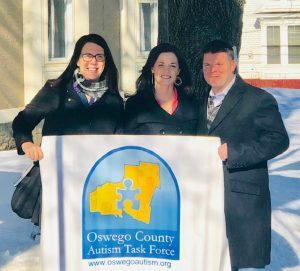 “We are very thankful to have the continued support of The Beacon Hotel and the Avery family this year,” said Oswego County Autism Task Force President Tammy Thompson. The run/walk will take participants through Oswego’s east side, scenic Fort Ontario area on April 6. Spectators and supporters who opt out of the 5K can also participate by enjoying a delicious meal for a great local cause. The OutRun Autism 5k and “Breakfast of Autism Champions” will benefit the Oswego County Autism Task Force who provides Autism Awareness and creates possibilities for those touched by Autism Spectrum Disorder in Oswego County. The 5k run will kick off at 8:30 a.m. in front of the Press Box Restaurant on East First Street in Oswego with awards to follow. All runners/walkers looking to celebrate the cause post-race or supporters looking to cheer on participants can meet up at the Press Box and enjoy the “Breakfast of Autism Champions” (from 9 – 11 a.m. for additional cost paid upon service to the Press Box) and proceeds will go be donated to the event as well. Registration is open by going to www.auyertiming.com. Registration will close on April 4.